What was TA 9 and then later 17009 passed along Park Road as it headed for Chesterfield town centre and the college on the morning of Wednesday 11th on its way in from Allestree. The company has done a rather nice tidying up job on the buses since they were transferred up from Devon. The clean lines of the livery, chrome wheels and dot-matrix blinds produce a pleasant result, and have all acquired 'Yorkshire Traction' registrations. Could the outlet names reflect the staple diet of students in the 21st Century, pizzas and mobile phones? 17008 (TA 8) passed by the Ravenside Retail Park just after 5.00pm on the 12th September with the destination set for the long run out to Buxton on route C2. The day before and 17008 reached the brow of the steep hill on Park Road on the late afternoon run out to Buxton. As indicated, a number of established Stagecoach operated routes have had adjustments made to them. In the main single journeys have been back projected or diverted. In this case route 97 has one journey in each direction adjusted so as to serve Heanor. 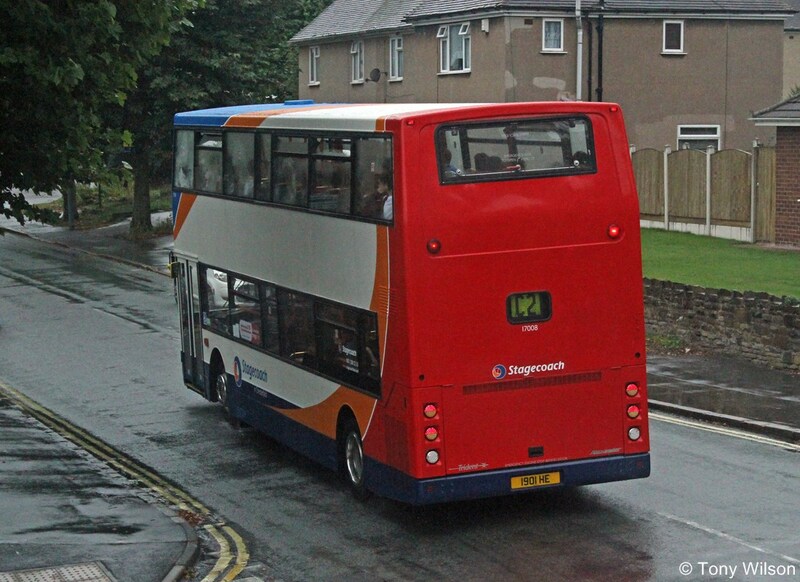 Here 17004 (TA 4) crossed Markham Road at the Park Road junction on the single-journey 98 numbered adjustment. And in the best traditions of reporting, other routes are also available. There is a sort of postscript to all this though. 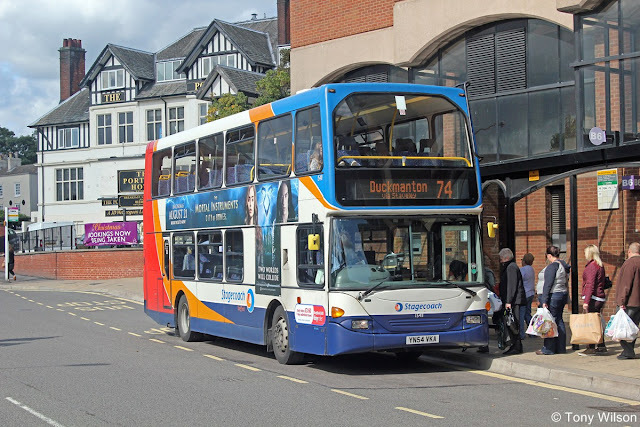 With capacity problems manifesting themselves on some of the other routes in the area, the Chesterfield management secured additional double-deckers. These have come in the shape of some older Scania N94UD East Lancs Omnidekkas from one of the Sheffield depots, swapped with some saloons. One of these two buses 15411 was pressed into revenue-earning on the 14th September on route 74 out to Duckmanton. It is illustrated here loading bag-laden shoppers on the stop in New Beetwell Street. 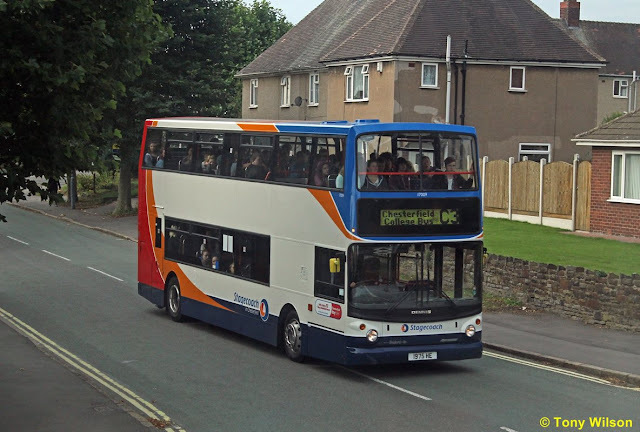 The other bus 15412 had appeared earlier on route 71 out to Killamarsh and then ironically also onwards to Sheffield. 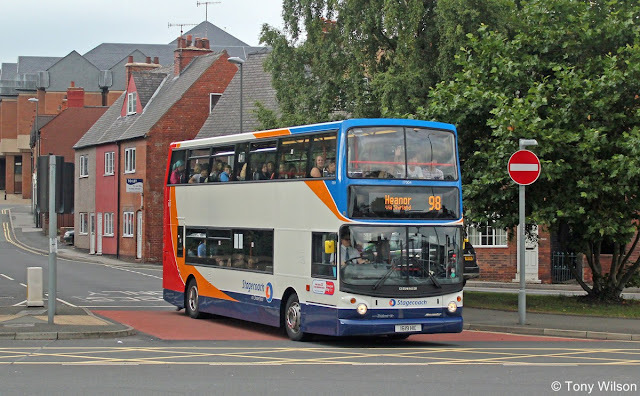 This batch of six buses had originally been ordered by and acquired new by Yorkshire Traction, around the time of the takeover by Stagecoach back in 2004, as fleet numbers 801-806. In this rather startling livery they were assigned to the long route X19 that ran from Barnsley through Doncaster to the then newly opened Robin Hood Airport, where indeed 803 rested between duties. IS THERE A BRIGHT FUTURE FOR TM TRAVEL? 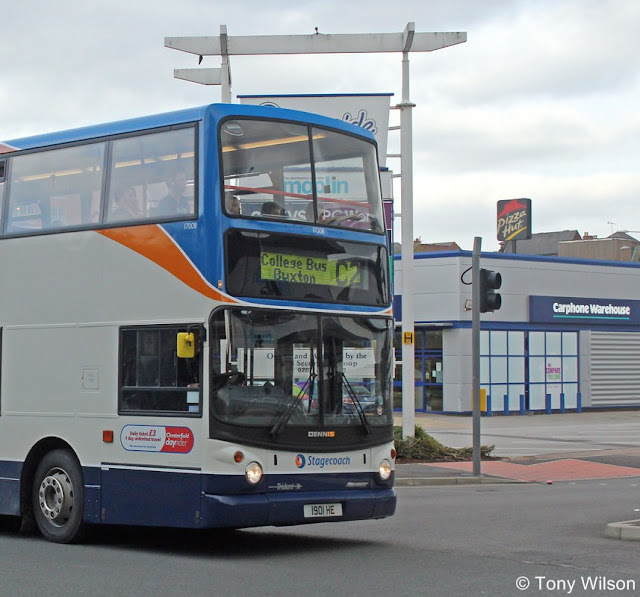 Hulleys of Baslow's second decker on service. First Sheffield add StreetLites to Fleet.